Back of card: Similar to the Ace of the Soul (above), but a middle aged male instead of an older female. Printed in a rich sepia/brown. Not for inversion. "The Chalice [cups] suit is the Soul suit represented by the Blue of night in which dreams, meditation & spirituality are reflected. The Pentacles are transformed into Yellow and the Jewels, symbolizing the radiance of daytime, energy, material & existence. Blue & Yellow united & mixed together make Green, the color of nature, the symbol of harmony, tranquility & life thus transforming the Wands suit. Opposite of & complimentary to Green is Red which expresses blood & therefore aggressiveness, survival, instinct & action: the suit of reference is the Sword which transforms into the Blood suit. But when Red fades away the Blue of night returns & the cycle starts again." Court cards: 11: Child. 12: Animal. 13: Woman. 14: Man. 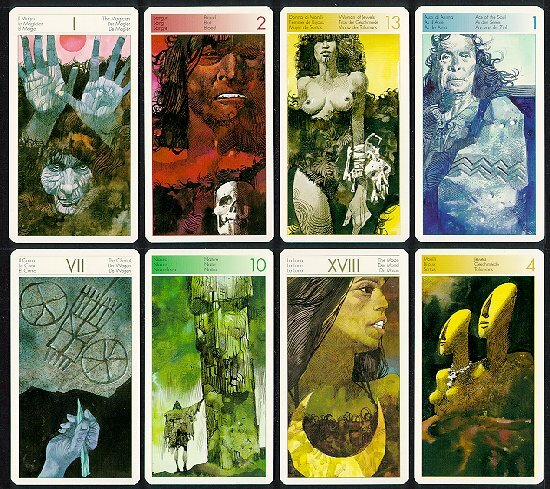 Major arcana cards sometimes have the traditional name (Fool, Magician, Death, etc.) & sometimes are renamed (Great Mother for High Priestess, Union for the Lovers, Abundance for Strength, etc. ).